Flexible packaging leader ProAmpac today joined with L’Oréal – Matrix Hair Care to celebrate acceptance of two Graphic Design USA (GDUSA) awards for “disruptive” consumer packaging that has helped “drive sales” and “reinforce the importance of packaging graphics” in successful on-shelf marketing. GDUSA, a magazine and information resource for graphic design professionals, announced today that L’Oréal – Matrix Hair Care’s Total Results Hair Care Holiday Kits 2018 have earned GDUSA’s American Package Design Award and the American Graphic Design Award. 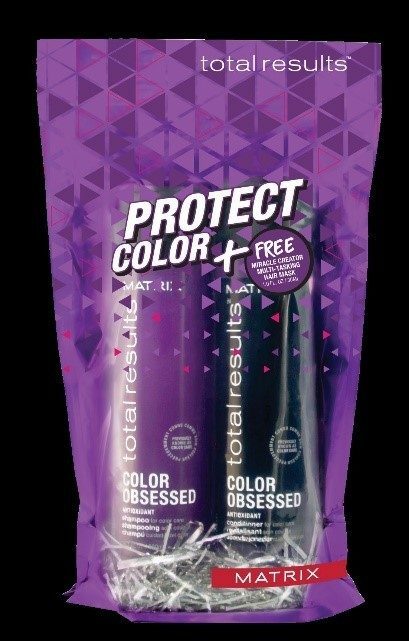 The award-winning packaging is produced by ProAmpac, the leader in flexible packaging, and collaborative innovation partner with L’Oréal – Matrix Hair Care, the haircare and hair color company that is part of L’Oreal USA’s Professional Products Division. “We wanted our holiday program to stand out and be disruptive on shelf,” said Elizabeth Richardson, assistant vice president haircare & channel marketing forL’Oréal – Matrix Hair Care. “In collaboration with ProAmpac, our vision of creating a limited-edition kit was brought to life through flexible packaging typically not seen in beauty. The brilliant metallics captured the brand’s energy and playfulness, and it didn’t hurt that it helped drive sales too!” Richardson added. “GDUSA’s awards reinforce the importance of packaging graphics. They serve as confirmation of ProAmpac’s investment in equipment and people dedicated to packaging that attracts attention as well as protecting our customers’ products,” said Adam Grose, chief commercial officer. “These awards also underscore ProAmpac’s approach to collaborative innovation, in which the brand leader and packaging company combine forces to develop breakout packaging concepts,” Grose said.